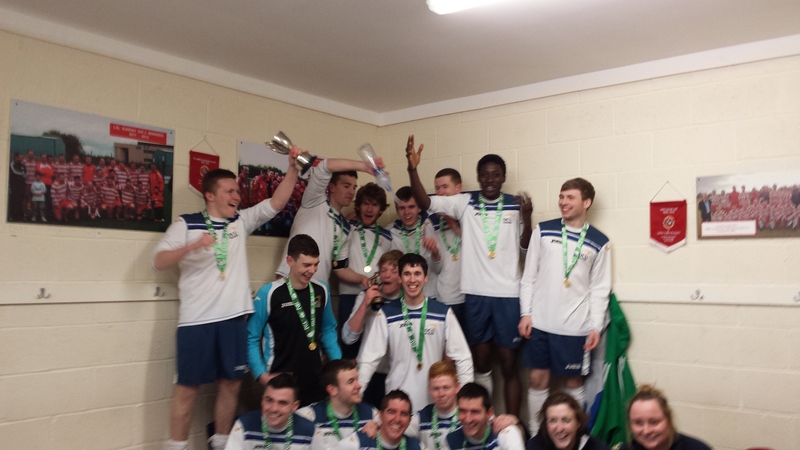 In the space of just ten days DCU’s fresher soccer team have added a league title to their recent Harding Plate success. With the game still locked at 1-1 after extra-time DCU managed to hold their nerve and come out on top in the penalty shootout. With four players missing from the team that won the Harding Plate, including match-winner Jordan Noonan, DCU were glad to be able to recall long-term absentees Chris Holmes, Bryan Goodson and Eoghan McDonnell. DCU started the game brightly and it was Holmes, making his first appearance since October, that had the first meaningful chance when he fired wide after a neat build up. IT Carlow had two chances in the first 20 minutes when on both occasions Ashley Houghton found space behind the DCU defence, the first time he missed the target but on the second occasion Darragh Hyland stood up well to save. After 30 minutes good footwork in the penalty area created a chance for Carlow’s Denis Quinlan but his strike failed to match the good play. Just on the stroke of half time Shane McCann, the man of the match on the day, had a free-kick well saved by Paul Miley in the Carlow nets. As the second half wore on DCU’s best chance of the game came after 80 minutes when Miley’s kickout was intercepted by Darragh Roche but his effort was well-saved by the recovering goalkeeper. Right on the whistle for half-time in extra-time there was drama as IT Carlow had a goal disallowed only for referee Adam Conroy to award a penalty. DCU’s Tolu Asemota received a red card for the tackle and Carlow’s Chris Sutton gladly stepped up to dispatch the penalty. However, five minutes later the teams were tied. Good build up play from the Dublin side eventually saw the ball fall to Eoghan McDonnell who placed a superb strike into the top corner. With the game tied after 120 minutes it came down to the dreaded penalty shootout to find a winner. After missing their opening spot-kick DCU managed to recover and win the shootout 4-2 with captain Sean Deane coolly slotting home the winning spot-kick. IT Carlow: Paul Miley, Martin Sutton, Sean Mooney, Devon Germaine, Adam Phelan, Chris Sutton, Mario Ebrahim, Lucas Presenti, Dean Conroy, Denis Quinlan, Ashley Houghton. Subs: Jonas Kerr for Ebrahim (52), Alex McCann for Presenti (65), Sol Yabre for Mooney (65), Kevin McLaughlin for Quinlan (65), Henry Kolawole, Khalad Burwise, Fergus Sweeney. DCU: Darragh Hyland, Michael McKenna, Shane McCann, Sean Deane, Bryan Goodson, Chris Holmes, Paul Boucher, Kevin Byrne, Tolu Asemota, Adam Walsh, Killian Ward. Subs: Enrique Hernandez for Boucher (h/t), Eoghan McDonnell for McKenna (h/t), Darragh Roche for Ward (65), Stefan Paun for Holmes (91).